Crossex is another co-ordinate motion puzzle from the workshop of Vinco. It's been a while since I looked at any of Vinco's co-ordinate motion puzzles, so I'm remedying that with this review. Crossex is available from Puzzlemaster, or Vinco directly. As always, the quality of the workmanship in the puzzle is excellent. It comes shrink wrapped with a small info card which contains the solution inside a folded paper, listing the difficulty rating as 3/5. Given that this is another co-ordinate motion puzzle, it instantly gets a higher rating in my book, but don't let that put you off. 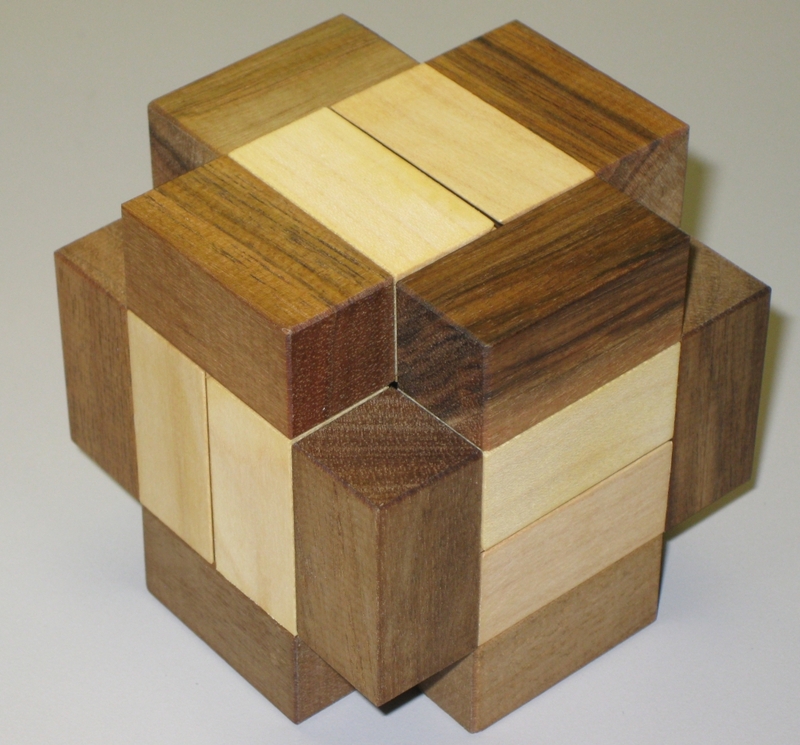 Made from variegated Walnut and Maple there's a good contrast between the pieces, and despite being part of the commercial line, there is still care and attention to the orientation of the grain in the pieces to make a really pleasing puzzle. I have no idea how Vinco manages this level of quality and still mass produces these. The cube is 2.5" cubed and expands up to 3.75" before it will collapse into a pile of pieces. As seems to be Vinco's current style, there's a rattling to be found from the inside of the puzzle, but that may or may not have much to do with its operation. I will admit I was a little disappointed when I pulled the pieces apart on this one to find that it is identical in mechanism to the MaTRIOshka puzzle which is based on Stewart Coffin's Expanding Box Puzzle. It's a design I need to revisit after my earlier failed attempts. Given that I've learned a lot since that first attempt, and I've had a few requests to go back to the design. 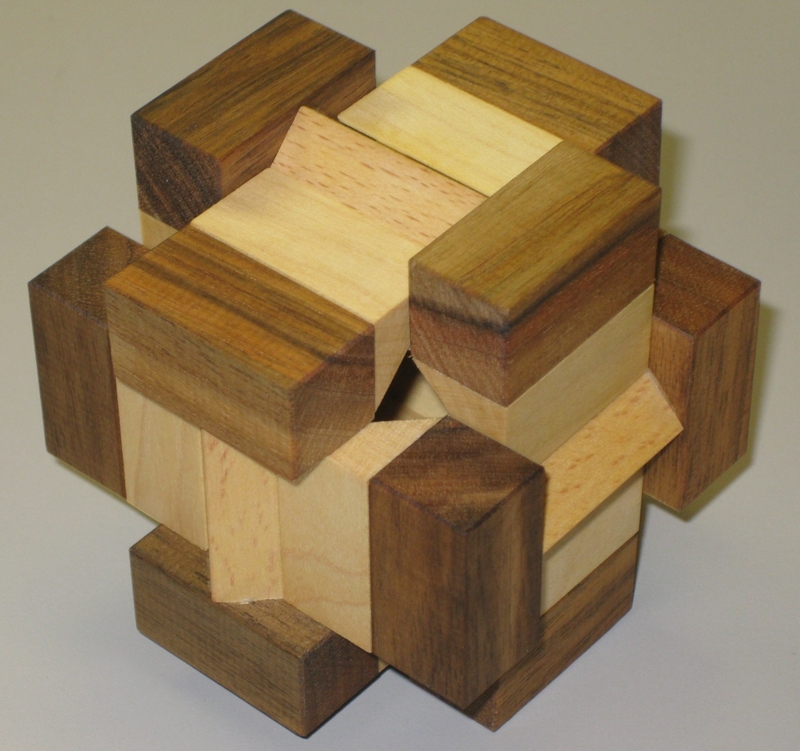 If you don't yet have a copy of Stewart Coffin's expanding box puzzle, then I'd recommend this version as it's very well made, and not expensive, especially given the fit and finish of the puzzle.